Huge, pure white, single flowers are produced in profusion on compact, bushy mounds of foliage. Due to its compact nature, this variety tolerates the weather (wind, rain, etc.) better than other Shastas making it one of the best daisies available. No sunny border should be complete without the some of these. 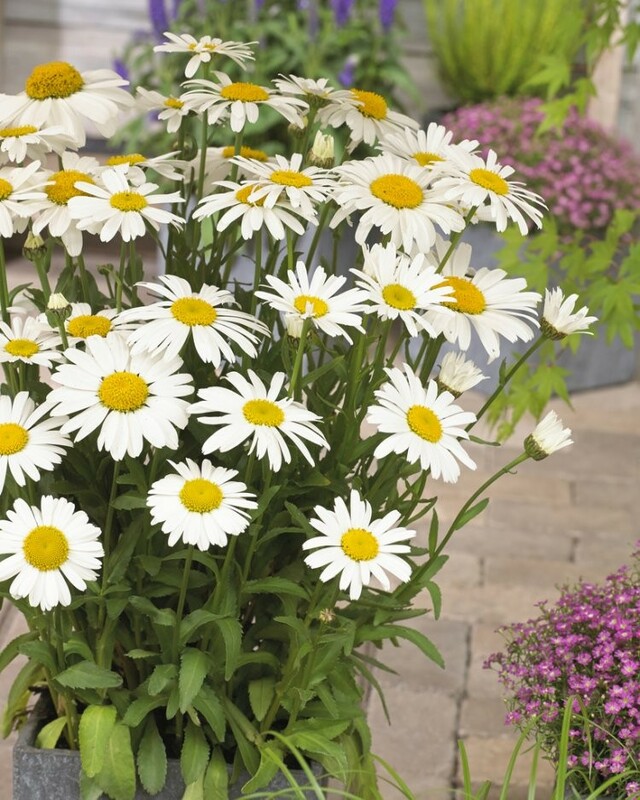 Snow Lady is a terrific dwarf strain, producing a low mound with a long succession of large white yellow-eyed daisies. It is great for edging and also excellent in tubs or mixed containers. Shasta Daisies really are a favourite for the perennial border. The cheery flowers begin to appear in late spring and continue on for several months if faithfully deadheaded. Shastas mix so effortlessly with other perennials that no garden should be without them! They're also attractive to butterflies and beneficial pollinators. Supplied in approx. 2-3 litre containers covered with buds and flowers in season for an instant display.